"Lori and Molly, I'm sorry to see that your dad passed last..."
"Gone to catch that big fish in the sky. Reel 'em in. Will..."
"Rene and family, I have no words to ease the pain you are..."
"Vern will be missed by all that meet him and all of us that..."
"I miss him a lot. We had a lot in common. He was a very..."
fishing and hunting with others." Vern passed away Sat. evening, Dec. 10th at home with his family. He was born on Nov. 24, 1943 in Vancouver, WA and was a lifelong resident of Clark County. Vern was married for 52 years to Rene Dollar and was a beloved father to Lori Young (Barry) of Ridgefield, Molly McCauley (Michael) of Anchorage, AK and Mike Dollar (Michele) of Battle Ground. Vern's pride and joy were his nine grandchildren: Kale, Cori Jo, Dylan, Hannah, Garret, Miles, Kevin, Jacie and Tommy. Also held dearly to his heart were his loving niece, Michele Church Sawyer and nephew, Greg Church. He was preceded in death by his parents, Virgil and Verna Dollar; sister, Virginia Church; and brother, Vaughn Dollar. Vern was proud of his Battle Ground roots and always referred to Dollar's Corner as the, "Hub of Clark County." He enjoyed his last occupation as owner of D&E Rods, where he designed and manufactured custom fishing rods. 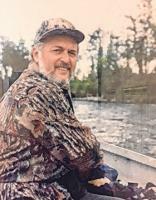 His passion for hunting and fishing was evident to all and was demonstrated in many ways. Among them was promoting the preservation of Salmon and Steelhead habitat in the Lewis River by working with Fish First. Memorial service will be held Thurs., Dec. 29th at 2p.m. in the afternoon at Battle Ground Baptist Church, 1110 NW 6th Avenue, Battle Ground, WA 98604. In lieu of flowers, donations may be made to Community Home Health and Hospice, 14508 NE 20th Ave., Ste. 201, Vancouver, WA 98686 or Fish First, Box 1505, Woodland, WA 98674.